As I rummaged through my desk the other day I came across a picture that reminded me of one of my magic moments in kayaking. I reserve the phrase "magic moment" for a very special time that becomes ingrained in my memory. I use "moment" because the feeling I am experiencing doesn't last long. These magic moments are usually a festival for my senses. I thought I would share some of my "magic moments" with my fellow paddlers because you are the best audience to appreciate them. My hope is you will recall some of your own and get that little smile on your face. I awoke at early morning light to pack up my camp and paddle back down Black Canyon on the Colorado River just a few miles below Hoover Dam. I was there to facilitate the UCSB Leadership Training Trip for future staff. The March mornings are usually crisp and clear. The water is almost like glass. 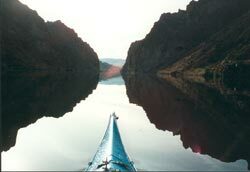 As I watched my bow and the reflection of the canyon walls and the sky off of the water, I felt as though I was flying. I could see sky beneath me and above me and for that magic moment I was weightless soaring through the air. 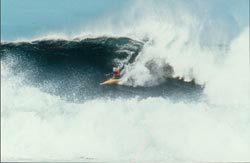 In October 1991, the day after the World Surf Kayaking Championships ended in Thurso Scotland, sets of large swells came in and we (meaning the US Surf Kayaking Team) decided to go out for a last day of surfing on these monster waves before we headed back to England for our flight home. The waves were big, powerful and were breaking onto a rock shelf. Your timing had to be perfect because the consequences were harsh. I was setting up with Dan and Mark. Here comes a big one and Dan says he is going to take it. As I looked out to sea I saw a larger wave looming behind Dan's wave. I tell Mark I have to take this one and Mark says he will go over the top of it. I found out after the ride that Mark didn't make it over the top and the wave ended up folding his kayak in half and splitting it from the coaming to under the seat. Mark was OK.
As the wave pitched up and I looked down the face I realized I was on the biggest wave of my career. I had already felt the consequences of smaller waves at this location. The combination of fear and excitement had every one of my senses heightened to a new level. There was no margin for error. I had to trust all those days of training and more importantly trust myself. I let go, relaxed and felt as if I was part of the wave. I slid down the face of the wave and felt the wind blowing out of the tube pushing me along. I heard the roar of thunder chasing me as I shot along the face. As I was going down it appeared as if this wall of water was going up. This was another magic moment. This was my lucky day because a German photographer (Michael Brackenhafer-photo credit) was there with his telephoto lens shooting my ride. 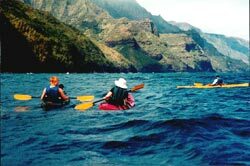 While paddling with friends along the Na Pali Coast of Kaua'i I saw a squall quickly approaching us. We were using Sit On Top boats so we were fully aware of the air temperature and the water temperature, which were both warm. The scenery was spectacular but it wasn't a magic moment, yet. As the squall hit the winds were howling and the rain was pelting us. Since my immersion clothing consisted of a Speedo bathing suit I could feel it all. The cooler rain was washing me from above. The warmer ocean water was splashing up over my lap. The air was a mixture of cool and warm. Since the wind was on my back I held up my paddle as if it were a sail and I let the squall push me along as it bathed me in fresh rainwater. My body was enjoying the diversity of sensations. This was the magic moment. Kim and I were returning from Hot Springs Cove and heading back to Tofino on Vancouver Island. We both like open-ocean paddling so we decided to take the outside route back. I would like to say having the Gray Whale surfacing right next to my kayak and covering me with spray was a magic moment. While it is an unforgettable memory (and smelly one too) my magic moment actually happens on land. If it weren't for my kayak I would not have been there. We camped that evening on Blunden Island. 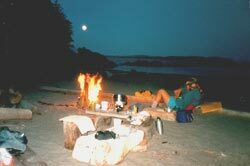 We had a driftwood fire going, dinner was finished and I was lying on my sleeping bag sipping on my hot chocolate. The sun was just setting and the full moon was rising over Vargas Island. The Gray whales were in the water in front of us spouting. I was warm, dry, fed, tired from a great paddle and witnessing natures show. You guessed it, another magic moment. Seeing that picture in my desk reminded me of the great times I have had in my kayak and why I continue to paddle. Last month when I wrote about reflecting I neglected to comment on the value of remembering the great times you have had in your kayak. I think the reason most of us paddle is enjoyment. It is nice to take time to think about those wonderful days provided by your kayak. As a person who likes to share their passions I thought I would try out an idea with the USK readers. If any of you have magic moments you would like to share, please e-mail me the magic moment (with permission to post it on the USK web site) and I will create a "Magic Moments in Kayaking" page so other kayaking enthusiasts can share in your experiences. Perhaps one magic moment can spark an idea for someone else to try a similar adventure. Who knows where I would be today if I never read Kon-Tiki.